I don’t know about you, but I absolutely love food that’s been thoughtfully prepared like hidden treasure such as dumplings, wontons, casseroles, & stuffed vegetables. Thanksgiving’s traditional turkey is not traditional without its stuffing & my mom made the best kind: a Vietnamese French fusion stuffing featuring pork, peas, carrots, onions, bean threads, mushrooms, & a whole lot more. I was so used to this stuffing that whenever I ate the traditional stuffed turkey, my body secretly yearned the “porkloaf” my mom made. Last year, I made one of the best stuffings I ever had & no animal was involved. Well, that’s not entirely true because I stuffed the turkey with my stuffing, but the point is the stuffing was vegan. While it doesn’t hold a candle to my mom’s “porkloaf” (oink oink!) made with some secret part of pig, my stuffing was still quite delicious. While these hidden gem meals are more time consuming to prepare, I find that I would much rather have a well prepared bowl of dumplings & noodles than a simple grilled fish with a side of vegetables. No hard feelings if you disagree, but for all of my vegetarians/vegans/pescetarians/people who just want a nice Meatless Mondays meal, invest in stuffing! 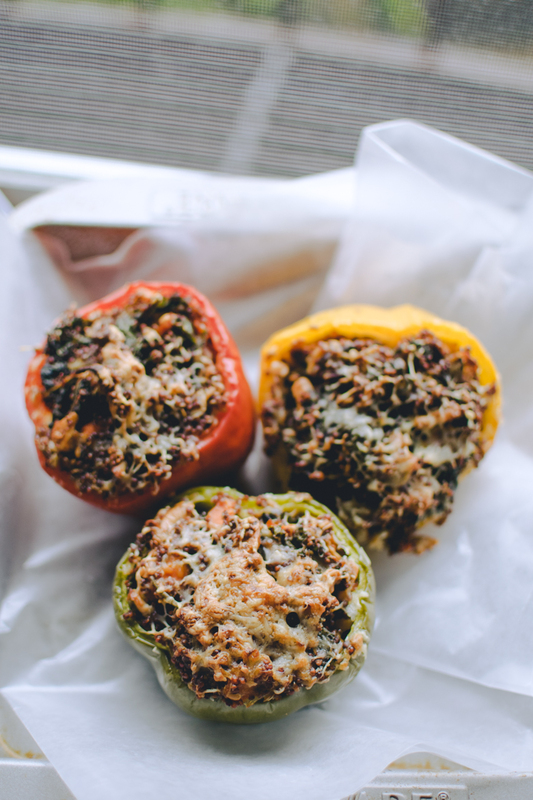 This recipe for Nutty Stuffed Peppers can easily be altered to one’s tastes & is naturally low in calories, bad fats, cholesterol, & low carb! It’s also gluten-free, so if you’re the 1% of Americans suffering from Celiac’s disease, have at it! I’ll have you know that I set off 3 fire alarms & 1 carbon monoxide detector making this dish because the wax paper I had lied about being oven friendly. Regardless, I’ve previously made this dish for Josh, who gave it a two thumbs up. The texture from the cashews, mushrooms, & the crispiness from the baked kale make this dish full of exciting flavors & textures. Add more Autumn inspired flavors by tossing in some butternut squash or pumpkin! This is the fantastic recipe for potlucks, Saturday dinners, or an alternative Thanksgiving meal. So, whether you’re trying to set off fire alarms or impress your friends/significant other/family/pet, this recipe is really quite easy to do & a power food! With ingredients like quinoa, kale, cashews, & mushrooms–the epitome of “hippie” ingredients–how could you go wrong? Besides, if anyone gives you a hard time because you decided to pick up the hippie hipster ingredients, you can tell them there’s nothing hipster about science, betches. Besides, California may be ridiculed for its yoga & kale obsessed culture, but there’s a reason why it’s the 8th Least Obese State. Massachusetts, which is the 5th Least Obese State, also likes to plant collard greens the way my grandma plants roses: decorative. So, laugh at the hippie hipster foods all you want, but it’s pure rationality that us quinoa + kale lovers are more likely to be healthier than the average American. Now excuse me while I go buy myself a Tiffany Blue yoga mat. +10 hipster points, -15 cool person points. These look amazing. 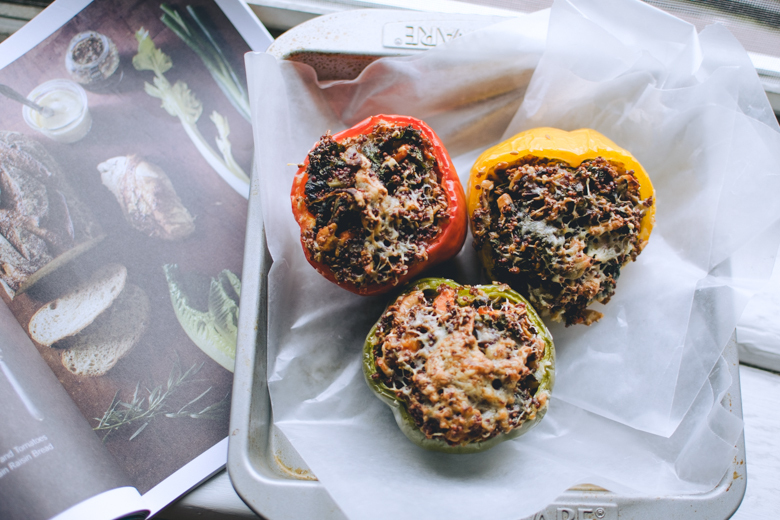 I loooove stuffed peppers, but I usually buy them pre-made which, now that I think about it, is kind of silly because it makes much more sense to be in charge of your own stuffing ratios. I could put so much more cheese in if I did it myself. A eureka moment! 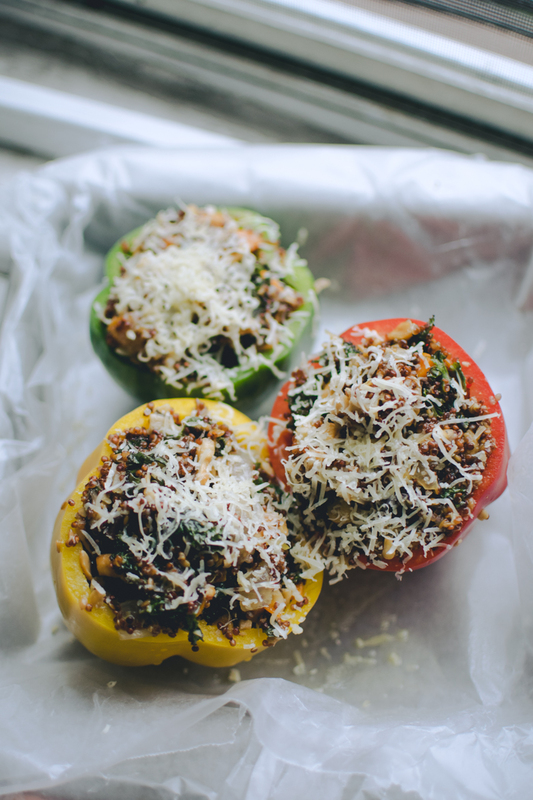 Mhmm, I love stuffed food and so I totally agree with you about it c: These stuffed peppers are looking good! I prefer to spend a bit more time on food preparation as well because enjoying my food a bit more after is rewarding! Thank you! 🙂 The more care & thought you put into a meal, the better it’ll taste! 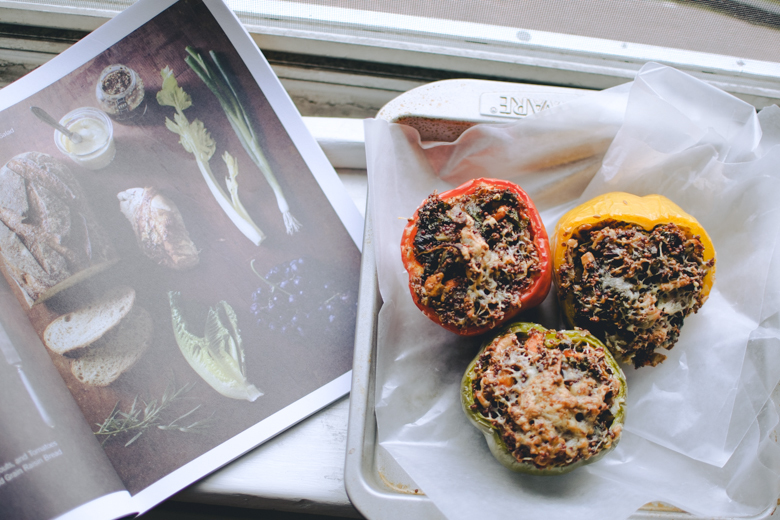 This stuffed pepper recipe looks great! 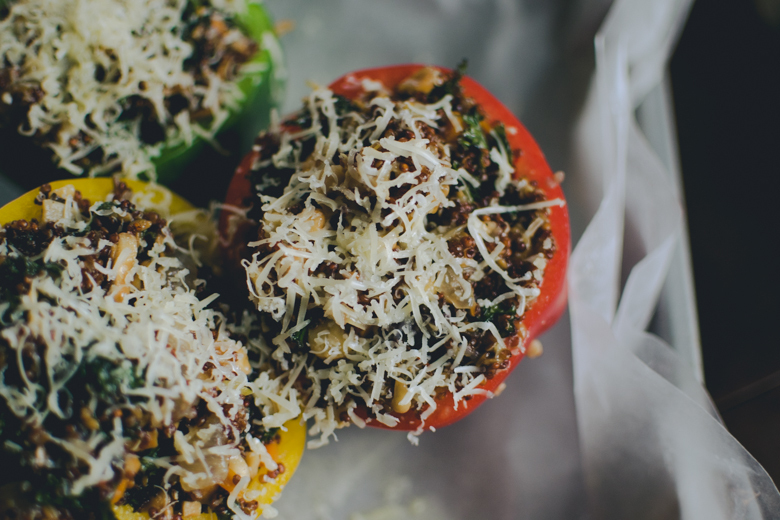 The girl I lived with in my first year of uni was a vegetarian and work cook stuffed peppers with vegetable chilli and topped them with cheese. She could never remember the recipe but every time it tasted so good. Thanks! Well, now you have a recipe to tweak to your liking. Thanks, Dani! Really?? The Brits in London don’t like their veggies? That’s a darn shame. Your mom’s stuffing sounds good! I didn’t grow up with turkey and stuffing for Thanksgiving (we pretty much had a Chinese meal), so I’ve never made it before. Your stuffed peppers look great too 😀 I like the items in the ingredient list! Austin is often on the “fittest/healthiest cities” list, and we’re known for being very hippie, haha. I agree that they’re related! I’m so surprised by that fact about Austin because Texas has 3 cities that top the “most obese” list. But hey, good on Austin for being healthier than the rest of the state! It is a huge metropolitan after all, so it makes sense actually. Sorry, I have such a negative view of Texas that I forget about Austin haha. Definitely a positive correlation between health & “hippie-ness”. Not really a bad thing when it means less trips to the emergency room for high cholesterol or a myocardial infarction! I’m all about that “hippie hipster” lifestyle though. Seattle has that kind of culture going on too and I’m always looking for new recipes to add to when I finally have my own kitchen to experiment in. My mom’s in charge of cooking in this house. I’ve tried to experiment with her around but she gets pretty protective over her territory so I let her be. But that definitely looks delicious! Hope you had a wonderful Thanksgiving by the way! My mom rarely tries anything new in the kitchen, especially not anything healthy. It’s kind of a bummer, but it’s her thing. I’m the complete opposite though & I hope you are too when you become a mom someday: try new healthy things in the kitchen, alllll da time! My dad loves my cooking though…my mom…really reluctant. MOMS, man. I feel you. I love the hippie hipster lifestyle, yo! I love it. I love the organic, local eating. I love the emphasis on recycling, using less energy, water, etc. It’s a good lifestyle & more people should take it up. Not saying everyone should just take up the hippie politics (couldn’t hurt though let’s be real – peace is not bad), but people should stay away from fast food & be more conscious about where their food comes from. How sustainable it is. Where it was raised. How it was raised. Spending more time at the gym & less time in front of a screen (I need to do this), etc. Hippies probably live longer than the average American anyway. Thanks! 🙂 I hope you do & if you do, tell me how it went!